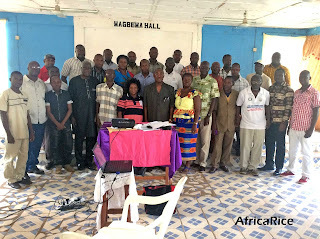 Scientists at the Rokupr Agricultural Research Center (RARC), Sierra Leone, one of the seven research centers within the Sierra Leone Agricultural Research Institute (SLARI) were trained by AfricaRice scientists in the concepts and principles of experimental design and data analysis, 23 to 27 May 2016. The training session, which was inaugurated by Dr Joseph Kargbo, SLARI Director General, was conducted by AfricaRice Biometrician Dr Ibnou Dieng, and AfricaRice Research Assistant Mr Amakoe Alognon, with support from AfricaRice scientists, who are working at RARC under the West Africa Agricultural Productivity Programme, Sierra Leone (WAAPP – 1C SL): Rice Research Coordinator Dr Olupomi Ajayi and Agricultural Economist Dr Ali Touré. Funding was provided by the World Bank and Government of Japan under the WAAPP – 1C SL. Trainees included 27 RARC scientists, two Monitoring and Evaluation (M&E) officers from SLARI and the WAAPP Project Coordinating Unit, SLARI statistician, WAAPP Grant Manager, and one staff member of the Sierra Leone Ministry of Agriculture, Forestry and Food Security. The training objectives were to: (i) provide good practices for managing data from rice experiments; (ii) train practitioners in the use of the software ‘Analysis with R is made Simple’ (ARiS) to generate experimental designs and to analyze and present their data in formats that would ensure their wide dissemination, especially through peer-reviewed publications; and (iii) train rice researchers in basic economic analysis of rice experiments. After the course, participants can identify appropriate experimental designs to be adopted and can use the ARiS software to randomize each of these designs. Participants will also be able to adopt good principles of data management to improve the quality and quantity of their research publications, to conduct statistical analyses (ANOVA, regression, correlation, etc. ), to assess whether or not the results statistically support the original research question, and to communicate the interpretation of statistical results. Evaluation by participants at the end of the training indicated that it met their expectations and the training’s goal and objectives. A number of trainees stated that although they had no theoretical knowledge of statistics and had depended on their colleagues for data analysis prior to the training, what they learned during the sessions has given them the confidence to plan, design and conduct trials and surveys, as well as analyze and interpret their own data. The trainees were excited about the new software ARiS, developed by Dr Ibnou Dieng at AfricaRice, and were determined to use it. Participants appreciated the resource persons and the sponsors. They plan to work in homogeneous groups to put into practice the knowledge obtained. 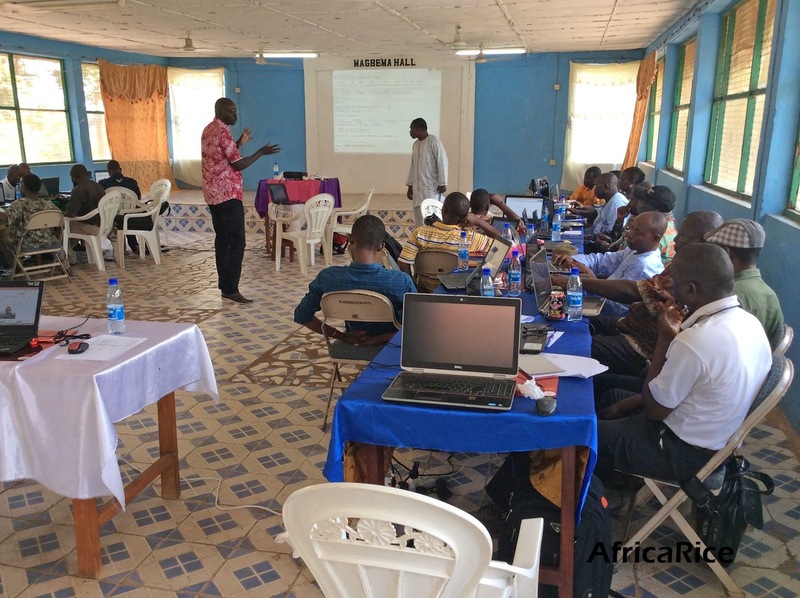 During the training, Dr Ibnou Dieng also held meetings with individual RARC scientists to discuss and address their individual data analysis needs. His Excellency Prof. Monty Jones, Minister of Agriculture, Forestry and Food Security of Sierra Leone, speaking during his visit to AfricaRice Headquarters in Abidjan, Côte d’Ivoire, on 8 April 2016.